I knew it would happen sooner or later: the restaurant I’m reviewing today shut its doors before I could even finish my review! 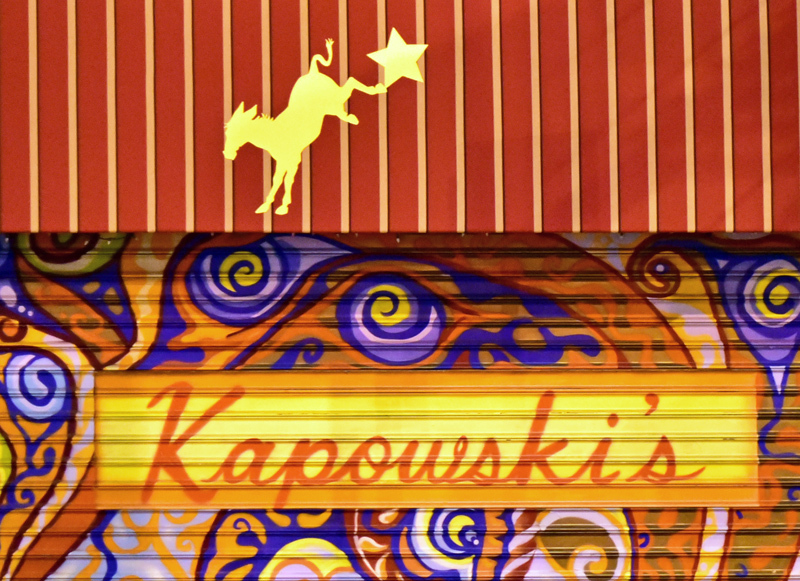 Kapowski’s, situated at 168 1/2 Delancey St. (love the 1/2), has closed a mere two months after its opening. This is the final (?) chapter of a long journey. 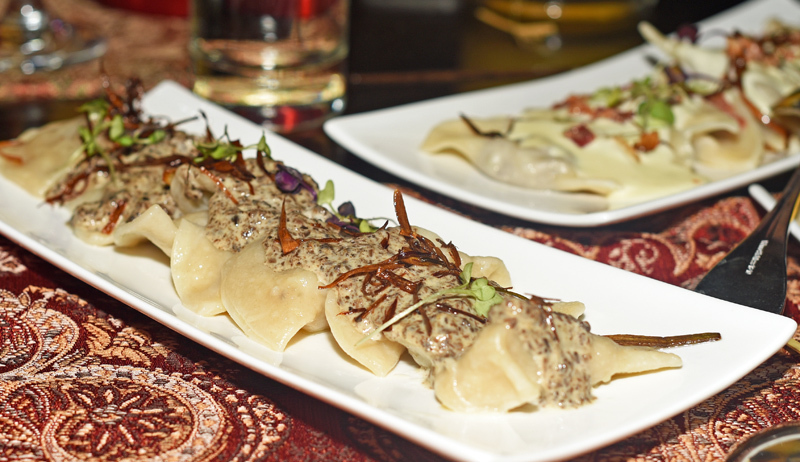 First, there was the Moscow 57 pop-up restaurant in Harlem. Then the venture finally found a home on the Lower East Side in 2014, but spent their first seven months without a gas hookup, preparing food without working stoves. In December 2014, the gas was at long last turned on. The team had big projects: pop-ups throughout the country and beyond, merchandising (borscht, yogurt, pelmeni, even lighting fixtures and carpets, I kid you not). After a break in the summer, the restaurant came back with a new name (a combination of the last names of proprietor Ellen Kaye and partner Tony Powe, with a Russian -ski suffix added for good measure), a new chef and a revamped menu. This latest incarnation is what we’ll look at today. I must warn you this won’t be a full-blown review, as I was only able to visit Kapowski’s once — for my birthday. My partner arranged a dinner party there as a surprise for me, and despite my time-tested, thorough note-taking habits, my judgement might still have been impaired by our group’s slightly immoderate consumption of vodka. The menu, consisting exclusively of small plates, hot or cold, suffers from a strange dichotomy. 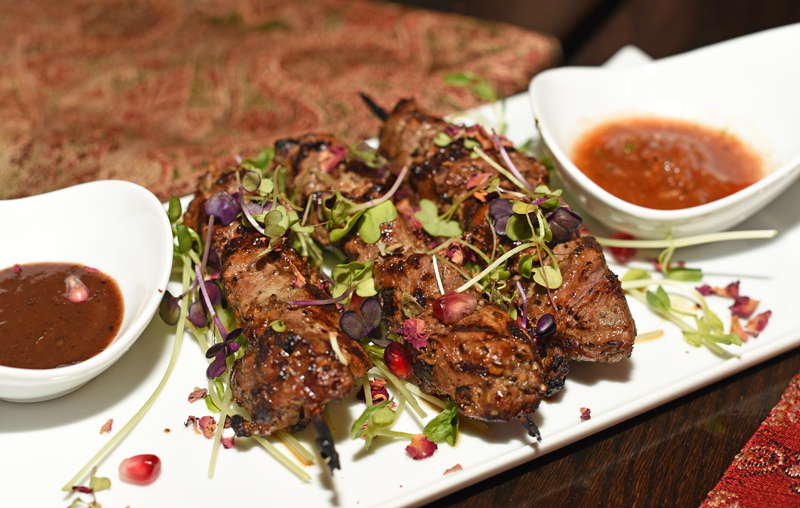 One side is dedicated to the “Silk Road Kitchen” with dishes from Turkey, Russia, the Caucasus, and Central Asia, plus a hint of Afghanistan, Egypt, and Italy — an eclectic total of approximately 11 dishes from 9 countries. The other side is the “Continental & Lower East Side Kitchen”, which evidently means a mix of French (cheese, tartare), Belgian (fries), German (cheese, sausages), American (wings, burger), and New York Jewish (smoked fish) offerings. Both “kitchens” show a strong preference for classics, which isn’t a bad thing, but there’s a certain lack of cohesion in my opinion. As usual, I’ll focus on the dishes that I can connect to my own definition of the Eastern Bloc. 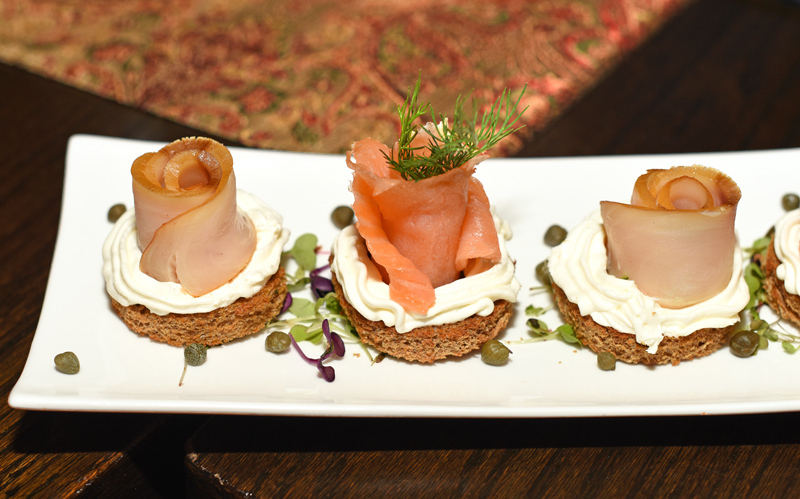 The smoked fish “off Clinton” is an assortment of smoked fish served on toasted rye bread with cream cheese. Beautiful presentation, good fish, though not on par with what you get at nearby Russ & Daughters. 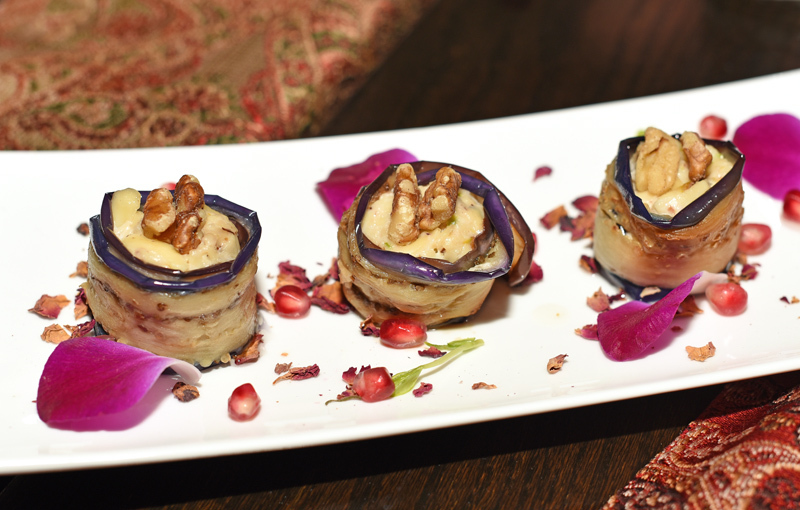 The Tbilisi Rolls are a variation on the typical Georgian walnut-stuffed eggplant rolls, with some cheese added to the filling. It’s a nice idea, I only wish there was less garlic. 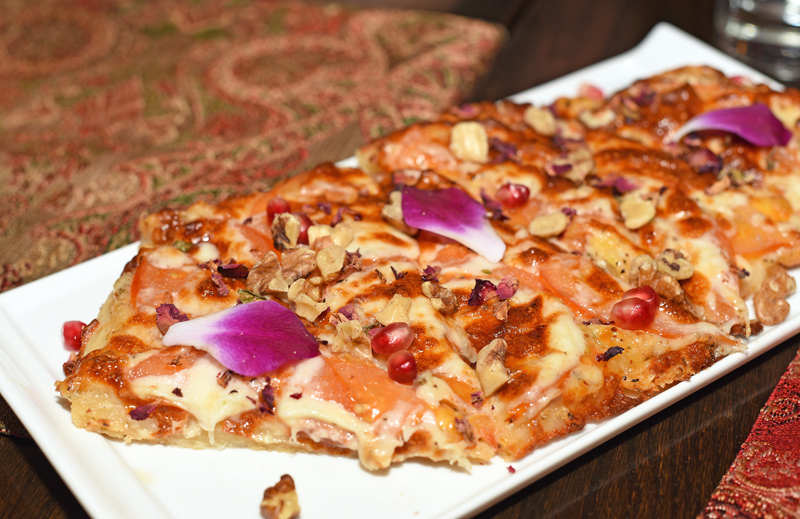 The pomegranate arils that decorate the plate could go straight into the filling too. 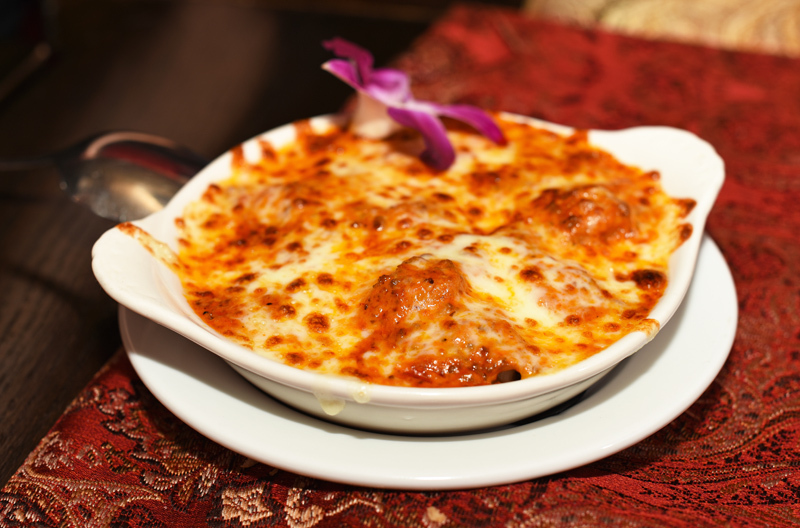 Kapowski’s pelmeni (Moscow meets Bologna) are a cross between the traditional Russian dumplings and an Italian lasagna. The cooked meat pelmeni are covered with what I believe is a tomato sauce, topped with cheese, and gratined. The pelmeni themselves are excellent, very soft, the filling moist and tender, the dough so thin I almost couldn’t feel it for a moment. The sauce tastes very good too, so this is our best dish so far. Just no more edible flowers, please! The varenyky, simply called Kapowski dumplings, come with a variety of fillings. As is customary, the dough is a tiny bit thicker than in pelmeni, but it’s still very soft and perfect. The mushroom-potato dumplings are quite rich, heavy on the potato and on what I imagine is a fair amount of butter — I approve. The cabbage dumplings may or may not be a mix of cabbage and sauerkraut, as they have a touch of sourness but not too much. Both versions come with sour cream, micro-greens, and fried onions. Very good. 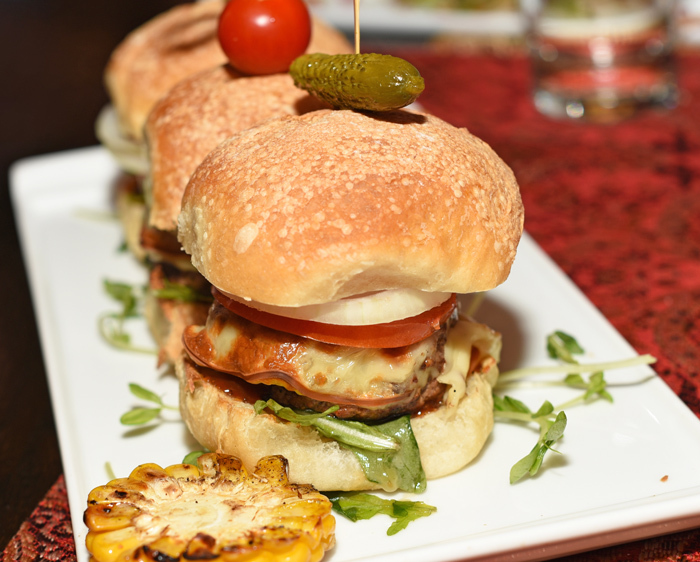 Max’s burgers (available with beef, lamb, or chicken patties) are well executed, pretty classic sliders. Cheese: check, tomato: check, onion: check, greens: check. I wish the beef burgers were cooked rare instead of well done, but hey, we didn’t ask. “What is this dish doing on an Eastern European blog?!?! ?”, I hear you scream. Well, the menu says “USA, Russia”, “bitki – Paris bistro”. All semantic, grammatical, and/or geographical questions should be directed to the chef. 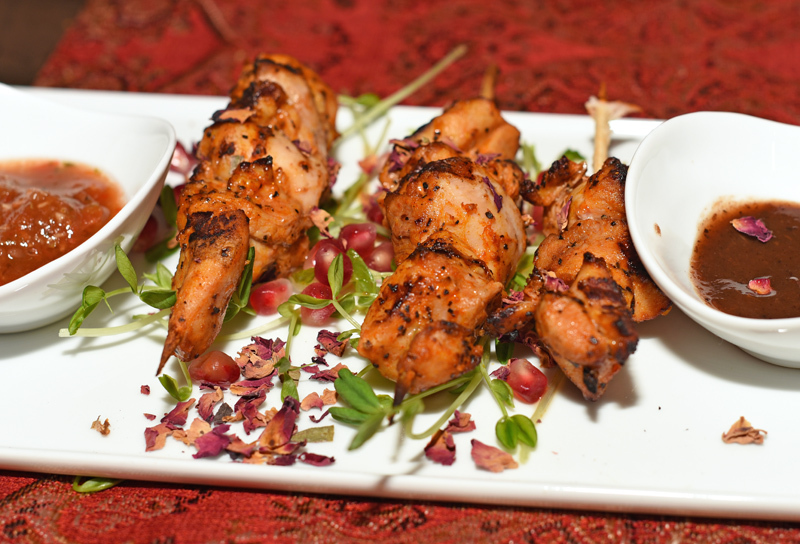 Like any self-respecting Russian-Caucasian-Central Asian-Turkish-Iranian restaurant, Kapowski’s serves kebabs. Great ones, even. Choose between lamb, chicken, and beef tenderloin for shashlyks (which, unlike in so many places, aren’t all prepared the same way), and lamb and chicken for lyulya-kebab. The lamb shashlyk arrives cooked medium rare, very tender, and fragrantly flavored by the marinade in which it was prepared. The chicken shashlyk, just as tender, is also marinated, but this time I taste smoked paprika and herbs. The lamb lyulya-kebab, though filed under Azerbaijan in the menu, reminds me more of a Georgian lyulya-kebab. No, I’m not just splitting hairs. 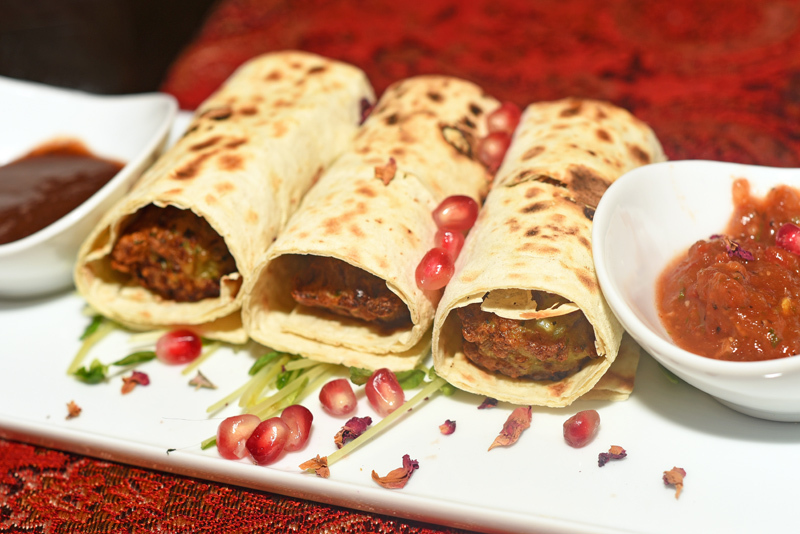 The authentic lyulya-kebab, which you encounter in Azerbaijan or in Uzbekistan, is made of lamb, fat, onion, and seasoning, ground all together and dangerously grilled on a skewer over a mangal. Let’s face it, the real masters of the kebabs are all Turkic people. Their neighbors just try to copy them as best they can, with mitigated success. Which takes us to the Georgian lyulya-kebab: much larger in diameter, denser, with more in the meat mixture than just seasoning (here, cilantro, and maybe some bread). It’s still good; it’s just a different beast. At Kapowski’s, it comes wrapped in lavash, and, like the above shashlyks, with two sauces that I forgot to taste. 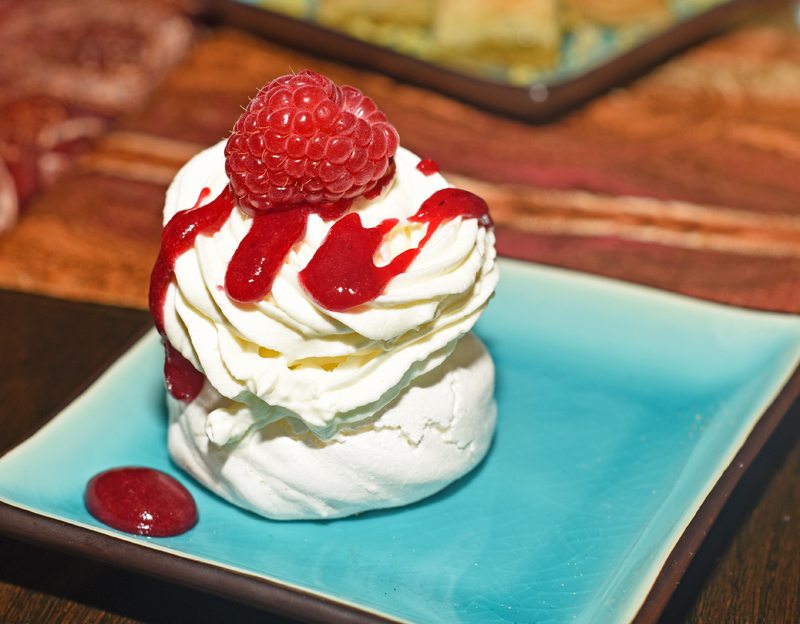 The culinary globe-trotting continues with the desserts. 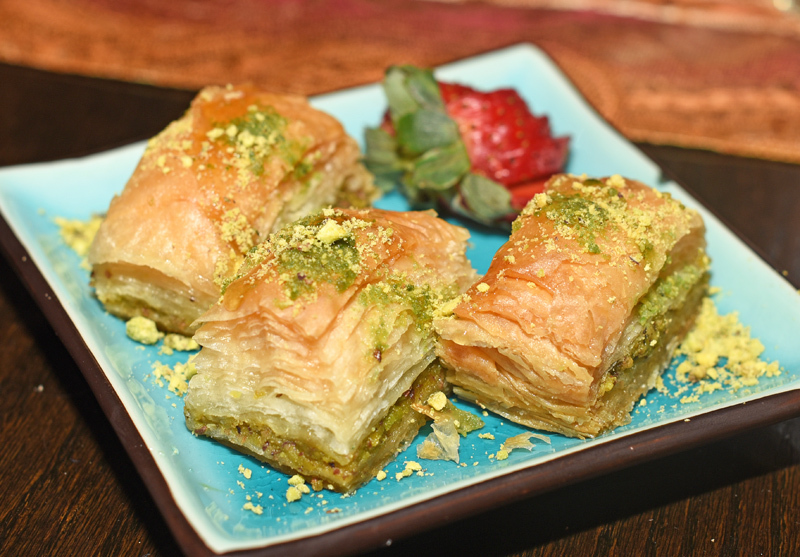 First, pistachio baklava in the Turkish style. I didn’t take notes, but I recall that everyone quite liked it, and judging by the picture, it was suitably moist. Yes, they have vodka. Well, they had vodka before our party, but I’m afraid we emptied the bar. Order some wine instead — the list is mostly French and reasonably priced. 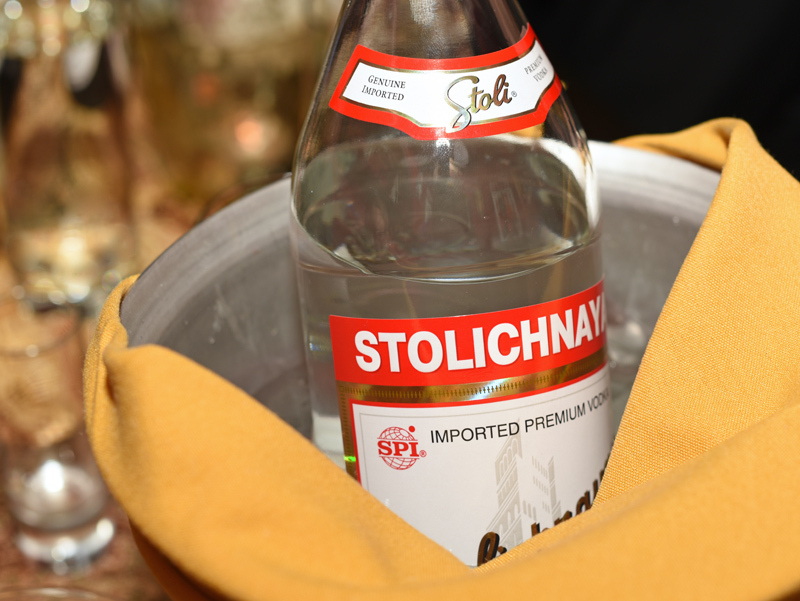 There’s a small Silk Road section where you’ll find, among other things, a decent Georgian dry white wine, and the only Armenian red wine that would be worth trying—if only it cost half the price (as it stands, it’s the most expensive wine on the list, champagne excluded). There’s also a lengthy cocktail list, divided into “Russia and Continental Europe”, “The Silk Road”, and “Lower East Side circa 1800”. We haven’t tried any of them, so all I can say is that many seem to adhere to the de rigueur New York City rule as per which a good mixed drink must contain at least one ingredient you’ve never heard of. The food at Kapowski’s is very good. I like the attention paid to the plating, save for a propensity for garnishing the plates with flowers that are edible but never eaten, or micro-greens whose presence is often justified solely by their contribution to the color spectrum of the plate. If you really must, keep the flowers on ONE dish for the occasional weirdo who enjoys munching on a cute pink petal. But on the pelmeni-lasagna?! Come on! One big surprise here is the new chef, Nikita Ponomarev. Nothing in his professional career really suggested greatness so far. In Russia, he worked at Il Patio, an Italian restaurant chain owned by the largest restaurant operator in Russia. After moving to the US, he worked on the line at Marseille, a French bistro like so many others in NYC. Then he became the head chef at Nasha Rasha, which has the dubious honor of being the worst restaurant I’ve ever reviewed on this blog (disclaimer: I don’t know if he was still working there at the time of my visits, although the timeline suggests so). Then all of a sudden he works at Taras Bulba, a pretty good Ukrainian restaurant, and eventually turns out great food at Kapowski’s. What’s next? Kapowski’s, you will be missed.